This is an excavated ancient Roman silver Miliarense of emperor Gratian dating to 367 - 375 AD. VIRTVS-EXERCITVS, Emperor standing facing, head left, holding labarum in right hand and resting left hand on shield. This coin was minted between the years 367 - 375 A.D. at Siscia (Sisak in Croatia), mintmark dot SISCP. It had traveled across the Roman Empire, being buried in the Thruxton Hoard. 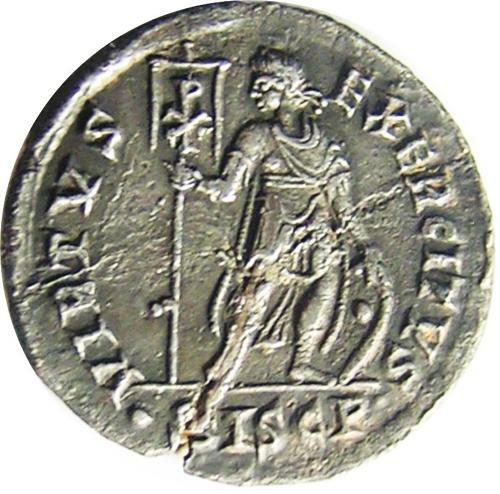 This coin was purchased directly from the finder after being disclaimed by the British Museum. DATE: 367 - 375 A.D.
ATTRIBUTION: RIC IX Siscia 10c, rated rare.